"Wisdom," the oldest know bird in the wild, has caught the imagination of the world - with her longevity and important role she plays as an ambassador for special places like our national wildlife refuges. 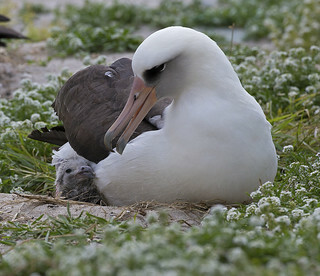 Midway Atoll National Wildlife Refuge provides 71% of the nesting habitat for the world's Laysan albatross and is the largest albatross nesting colony on the planet! Wisdom is at least 63 years old having been first banded in 1956. She continues to return to Sand Island to nearly the exact same spot to fulfill her instinctive duty of ensuring the Laysan albatross population continues to thrive. Here she cares for her newest chick. She laid her egg on November 29, 2013 and it hatched on February 5, 2014. Always exciting to see her and even more so when she rears a chick.